Glory just arrived from the Birmingham race track. She is a small brindle girl that raced at 57lbs. 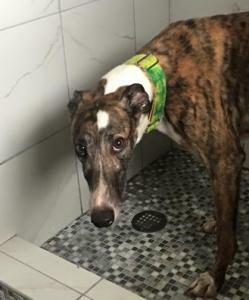 She is mostly brindle with a white chest and ring that runs up around her neck referred to as "Irish Markings". She also has a white spot on her head and white feet. She just turned 4 on January 3rd. Glory's sire is Flame's Nash and her dam is Nicoles Andrea. She raced 163 races at Orange Park in Jacksonville FL, then Daytona Beach and finally Birmingham. She placed a lot so stayed in the money without winning a lot of races. Glory passed her cat and small dog tests so should be good to live with either. She was a little interested in the cat in her foster home at first but the cat let her know he didn't appreciate the attention. She has done well with that cat and the small dogs in her foster home. She is a sweet friendly girl that has transitioned to home life really well. She already whines to go out and hasn't had a single accident in the house. She has done fine with the 5 other dogs in the house. She does bark sometimes when she sees something odd or strange so may be the rare greyhound that could actually be a watch dog.